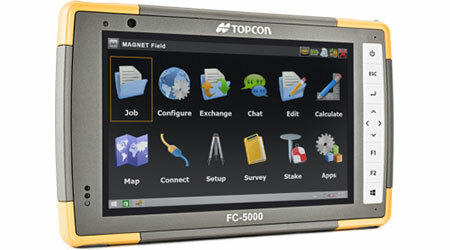 The FC-5000 field computer features a 7 inch display especially designed for viewing in direct sunlight. The display has a capacitive touch interface (finger, glove, small tip stylus and water capable) that is optically bonded to increase visibility. The glass is scratch resistant. With one key press the user can change the orientation of the screen from Portrait to Landscape to increase visibility viewing maps or drawings. In addition to IP68 certification, which protects against dust and allows the unit to be waterproof up to one meter for 2 hours, the FC-5000 is independently certified to MIL-STD 810G standard, and can operate in temperatures from -20° C to 50° C (-4° F to 122° F). The Windows 10 professional embedded operating system provides a modern operating environment and added expandability with other application software. 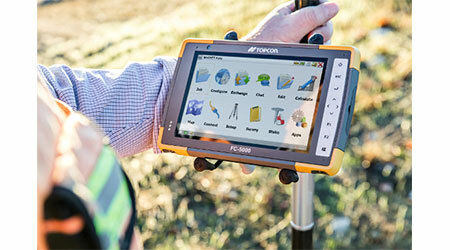 The fast Intel® Atom™ Z3745 Processor drives any of the Topcon field application software with ease. The FC-5000 has two built-in cameras: an 8 MP camera with auto focus comes with LED flash on the back of the unit for field photography and a 2MP camera on the front for video meetings. The unit’s location is passed to MAGNET Field data collection software for instant and convenient tagging GPS position, time, and date. The optional integrated 4G LTE cellular modem is a global device capable of data communication with Topcon’s MAGNET software solutions to send and receive data from active project sites. Easily communicate with field crews when projects need to be changed or if important data is required back in the office. The GPS option provides a navigational functionality that is capable of accuracies in the 2-5 meter range. The internal receiver chip offers a 72 channel, all in view tracking up to 1Hz. This internal GPS can be used for navigation or general positioning as well as ready to be used with MAGNET Field data collection software. Bluetooth and WiFi come standard on the FC-5000 field computer. Use Topcon’s LongLink communication method to communicate directly to a Topcon’s optical total station lineup. Use your device in any “hotspot” location to surf the web, check weather, e-mail, send to and receive files from the office, etc. There is one Li-Ion battery packs with 40Wh. Typical battery life is 10+ hours. With Topcon’s “intelligent” batteries, there is no worry about ever overcharging. To recharge the battery is only 2 to 4 hours. You can get 50% power to the battery in as little as 1 hour. This battery has excellent performance under extreme conditions. There is a second battery on the board built in to the FC-5000 that provide 2 to 3 hours of power.